"Heart bypass" redirects here. For the technique to take over the function of the heart and lungs during surgery, see Cardiopulmonary bypass. Early in a coronary artery bypass operation, during vein harvesting from the legs (left of image) and the establishment of cardiopulmonary bypass by placement of an aortic cannula (bottom of image). The perfusionist and heart-lung machine are on the upper right. The patient's head (not seen) is at the bottom. There are two main approaches. In one, the left internal thoracic artery (left internal mammary artery or "LIMA") is diverted to the left anterior descending (LAD) branch of the left main coronary artery. In the other, a great saphenous vein is removed from the leg; one end is attached to the aorta or one of its major branches, and the other end is attached to the obstructed artery immediately after the obstruction to restore blood flow. It is performed to relieve angina unsatisfactorily controlled by maximum tolerated anti-ischemic medication, prevent or relieve left ventricular dysfunction, and/or reduce the risk of death. It does not prevent heart attacks. This surgery is usually performed with the heart stopped, necessitating the usage of cardiopulmonary bypass; however, two alternative techniques are also available allowing CABG to be performed on a beating heart either without using the cardiopulmonary bypass deemed as "off-pump" surgery or performing beating surgery using partial assistance of the cardiopulmonary bypass called as "on-pump beating" surgery. The latter gathers the advantages of the on-pump stopped and off-pump while minimizing their respective side-effects. Arteries usually have a 50% to 99% obstruction. The obstruction being bypassed is due to arteriosclerosis, atherosclerosis, or both. Arteriosclerosis is characterized by thickening, loss of elasticity, and calcification of the arterial wall, most often resulting in a generalized narrowing in the affected coronary artery. Atherosclerosis is characterized by yellowish plaques of cholesterol, lipids, and cellular debris deposited into the inner layer of the wall of a large or medium-sized coronary artery, most often resulting in a focal partial obstruction in the affected artery. Each can limit blood flow if it causes a cross-sectional narrowing of at least 50%. Three coronary artery bypass grafts, a LIMA to LAD and two saphenous vein grafts – one to the right coronary artery system and one to the obtuse marginal system. There are many variations in terminology, in which one or more of "artery", "bypass" or "graft" is left out. The most frequently used acronym for this type of surgery is CABG (pronounced 'cabbage'), pluralized as CABGs (pronounced 'cabbages'). Initially the term aortocoronary bypass (ACB) was more popularly used to describe this procedure. CAGS (coronary artery graft surgery, pronounced phonetically) should not be confused with coronary angiography (CAG). The terms single bypass, double bypass, triple bypass, quadruple bypass and quintuple bypass refer to the number of coronary arteries bypassed in the procedure. In other words, a double bypass means two coronary arteries are bypassed (e.g., the left anterior descending (LAD) coronary artery and right coronary artery (RCA)); a triple bypass means three vessels are bypassed (e.g., LAD, RCA and left circumflex artery (LCX)); a quadruple bypass means four vessels are bypassed (e.g., LAD, RCA, LCX and first diagonal artery of the LAD) while quintuple means five. Left main coronary artery obstruction requires two bypasses, one to the LAD and one to the LCX. 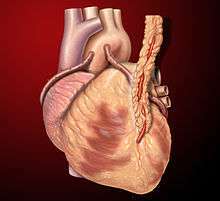 Bypass of more than four coronary arteries is uncommon. A coronary artery may be unsuitable for bypass grafting if it is small (< 1 mm or < 1.5 mm), heavily calcified, or located within the heart muscle rather than on the surface. A single obstruction of the left main coronary artery is associated with a higher risk for a cardiac death and usually receives a double bypass. The surgeon reviews the coronary angiogram prior to surgery and identifies the number of obstructions, the percent obstruction of each, and the suitability of the arteries beyond the obstruction(s) as targets. 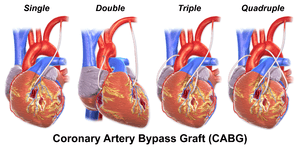 The presumed number of bypass grafts needed as well as the location for graft attachment is determined in a preliminary fashion prior to surgery, but the final decision as to number and location is made at surgery via direct examination of the heart. Disease of the left main coronary artery (LMCA). Disease of all three coronary vessels (LAD, LCX and RCA). Diffuse disease not amenable to treatment with a PCI. The 2005 ACC/AHA guidelines further state that CABG is the preferred treatment with other high-risk patients such as those with severe ventricular dysfunction (i.e. low ejection fraction), or diabetes mellitus. There is no survival benefit with bypass surgery vs. medical therapy in stable angina patients. Bypass surgery does not prevent future myocardial infarctions. Age per se is not a factor in determining risk vs benefit of CABG. CABG or stent placement is indicated when medical management - anti-anginal medications, statins, antihypertensives, smoking cessation, and /or tight blood sugar control in diabetics - do not satisfactorily relieve ischemic symptoms. The SYNTAX trial was a randomized controlled trial of 1800 patients with multivessel coronary disease, comparing CABG versus PCI using drug-eluting stents (DES). The study found that rates of major adverse cardiac or cerebrovascular events at 12 months were significantly higher in the DES group (17.8% versus 12.4% for CABG; P=0.002). This was primarily driven by higher need for repeat revascularization procedures in the PCI group with no difference in repeat infarctions or survival. Higher rates of strokes were seen in the CABG group. The FREEDOM (Future Revascularization Evaluation in Patients With Diabetes Mellitus—Optimal Management of Multivessel Disease) trial will compare CABG and DES in patients with diabetes. The registries of the nonrandomized patients screened for these trials may provide as much robust data regarding revascularization outcomes as the randomized analysis. A study comparing the outcomes of all patients in New York state treated with CABG or percutaneous coronary intervention (PCI) demonstrated CABG was superior to PCI with DES in multivessel (more than one diseased artery) coronary artery disease (CAD). Patients treated with CABG had lower rates of death and of death or myocardial infarction than treatment with a coronary stent. Patients undergoing CABG also had lower rates of repeat revascularization. The New York State registry included all patients undergoing revascularization for coronary artery disease, but was not a randomized trial, and so may have reflected other factors besides the method of coronary revascularization. A meta-analysis with over 6000 patients showed that coronary artery bypass was associated with lower risk for major adverse cardiac events compared to drug-eluting stenting. However, patients had a higher risk of stroke events. Prognosis following CABG depends on a variety of factors, and successful grafts typically last 8–15 years. In general, CABG improves the chances of survival of patients who are at high risk (generally triple or higher bypass), though statistically after about five years the difference in survival rate between those who have had surgery and those treated by drug therapy diminishes. Age at the time of CABG is critical to the prognosis, younger patients with no complicating diseases doing better, while older patients can usually be expected to suffer further blockage of the coronary arteries. Grafts can become diseased and may partially or completely occlude - that is, lose their patency - in the months to years after bypass surgery is performed. A graft is considered patent if there is normal flow through the graft: flow begins to diminish with around a 70 percent stenosis in the graft. Graft patency is dependent on a number of factors, including the type of graft used (internal thoracic artery, radial artery, or great saphenous vein), the size of the coronary artery that the graft is anastomosed with, and, of course, the skill of the surgeon(s) performing the procedure. Arterial grafts (e.g. LITA, radial) are far more sensitive to rough handling than the saphenous veins and may go into spasm if handled improperly. Generally the best patency rates are achieved with the in-situ left internal thoracic artery (the proximal end is left connected to the subclavian artery) with the distal end being anastomosed with the coronary artery (typically the left anterior descending artery or a diagonal branch artery). Lesser patency rates can be expected with radial artery grafts and "free" internal thoracic artery grafts (where the proximal end of the thoracic artery is excised from its origin from the subclavian artery and re-anastomosed with the ascending aorta). Saphenous vein grafts have worse patency rates, but are more available, as the patients can have multiple segments of the saphenous vein used to bypass different arteries. Veins that are used either have their valves removed or are turned around so that the valves in them do not occlude blood flow in the graft. LITA grafts are longer-lasting than vein grafts, both because the artery is more robust than a vein and because, being already connected to the arterial tree, the LITA need only be grafted at one end. The LITA is usually grafted to the left anterior descending coronary artery (LAD) because of its superior long-term patency when compared to saphenous vein grafts. Postperfusion syndrome (pumphead), a transient neurocognitive impairment associated with cardiopulmonary bypass. Some research shows the incidence is initially decreased by off-pump coronary artery bypass, but with no difference beyond three months after surgery. A neurocognitive decline over time has been demonstrated in people with coronary artery disease regardless of treatment (OPCAB, conventional CABG or medical management). However, a 2009 research study suggests that longer term (over 5 years) cognitive decline is not caused by CABG but is rather a consequence of vascular disease. Loss of mental function is a complication of bypass surgery in elderly people, and might influence procedure cost benefit considerations. Several factors may contribute to immediate cognitive decline. The heart-lung blood circulation system and the surgery itself release a variety of debris, including bits of blood cells, tubing, and plaques. For example, when surgeons clamp and connect the aorta to tubing, resulting emboli block blood flow and cause mini strokes. Other heart surgery factors related to mental damage may be events of hypoxia, high or low body temperature, abnormal blood pressure, irregular heart rhythms, and fever after surgery. Nonunion of the sternum; internal thoracic artery harvesting devascularizes the sternum increasing risk. Myocardial infarction due to embolism, hypoperfusion, or graft failure. Late graft stenosis, particularly of saphenous vein grafts due to atherosclerosis causing recurrent angina or myocardial infarction. Acute renal failure due to embolism or hypoperfusion. Stroke, secondary to embolism or hypoperfusion. Graft failure: grafts last 8–15 years, and then need to be replaced. Pericardial tamponade: Blood collection around the heart that compresses the heart and causes poor body and brain perfusion. Chest tubes are placed around the heart and lung to prevent this. If the chest tubes become clogged in the early post operative period when bleeding is ongoing this can lead to pericardial tamponade, pneumothorax or hemothorax. Pleural effusion: Fluid in the space around the lungs. This can lead to hypoxia which can slow recovery. Lower extremity edema, extravasation, inflammation, and eccymoses from vein harvest; entrapment of up to 9 pounds (4.1 kg) of fluid in the extremity is common. This is managed with a thigh length compression stocking, elevation of the limb, and early and frequent slow walking; as well as avoidance of standing in place, sitting, and bending the leg at the knee more than a few degrees. Post-operative atrial fibrillation and atrial flutter. Anemia - secondary to blood loss, plus the anemia of inflammation, inflammation being inevitable with opening the chest plus harvesting of leg vein(s) for grafting. A fall in the hemoglobin from normal preoperative levels (e.g. 15) to postoperative levels of 6 to 10 are inevitable. There is no benefit from transfusions until the hemoglobin falls below 7.5. Institutions should establish protocols to ensure transfusions are not given unless the hemoglobin falls below 7.5 without some additional compelling reason(s). Hold a pillow against the chest whenever getting out of or into a chair or bed; or coughing, sneezing, blowing nose, or laughing, in order to oppose the intrathoracic outward force created by these activities on the healing sternum. Avoid using the pectoral muscles, such as by pushing on the chair arms to assist one's self out of a chair, or by using the arms to assist in sitting down. Proper standing technique is to rock three times in the chair and then stand to provide momentum for moving the center of gravity from the sitting to the standing position. Proper sitting technique is to slowly lower the bottom toward the chair seat using gluteus and quadriceps muscles ("legs only") without grabbing the chair arms. Second, patients should avoid lifting objects utilizing the pectoral muscles: carrying light objects with arms extended down at sides, and lifting light objects with the elbows pressed to the chest and using the biceps, are acceptable. Also, avoid using the arms overhead. Avoid sitting in the car front seat (no driving) for at least four weeks: the explosion of the deployment of an airbag could refracture the sternal union. Illustration of a typical coronary artery bypass surgery. 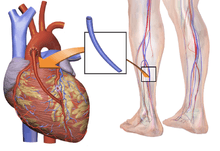 A vein from the leg is removed and grafted to the coronary artery to bypass a blockage. The patient is brought to the operating room and moved onto the operating table. An anaesthetist or anesthesiologist places intravenous and arterial lines and injects an analgesic, usually fentanyl, intravenously, followed within minutes by an induction agent (usually propofol or etomidate) to render the patient unconscious. An endotracheal tube is inserted and secured by the anaesthetist and mechanical ventilation is started. General anaesthesia is maintained with an inhaled volatile anesthetic agent such as isoflurane. The chest is opened via a median sternotomy and the heart is examined by the surgeon. The bypass grafts are harvested – frequent vessels are the internal thoracic arteries, radial arteries and saphenous veins. When harvesting is done, the patient is given heparin to inhibit blood clotting. In the case of "off-pump" surgery, the surgeon places devices to stabilize the heart. In the case of "on-pump" surgery, the surgeon sutures cannulae into the heart and instructs the perfusionist to start cardiopulmonary bypass (CPB). Once CPB is established, there are two technical approaches: either the surgeon places the aortic cross-clamp across the aorta and instructs the perfusionist to deliver cardioplegia with a cooled potassium mixture to stop the heart and slow its metabolism or performing bypasses on beating state (on-pump beating). One end of each vein graft is sewn on to the coronary arteries beyond the obstruction and the other end is attached to the aorta or one of its branches. For the internal thoracic artery, the artery is severed and the proximal intact artery is sewn to the LAD beyond the obstruction. Aside the latter classical approach, there are emerging techniques for construction of composite grafts as to avoiding connecting grafts on the ascending aorta (Un-Aortic) in view of decreasing neurologic complications. The heart is restarted; or in "off-pump" surgery, the stabilizing devices are removed. In cases where the aorta is partially occluded by a C-shaped clamp, the heart is restarted and suturing of the grafts to the aorta is done in this partially occluded section of the aorta while the heart is beating. Protamine is given to reverse the effects of heparin. Chest tubes are placed in the mediastinal and pleural space to drain blood from around the heart and lungs. The sternum is wired together and the incisions are sutured closed. The patient is moved to an intensive care unit (ICU) or cardiac universal bed (CUB) to recover. Nurses in the ICU monitor blood pressure, urine output, respiratory status, and chest tubes for excessive or no drainage. Excessive drainage suggests continued bleeding which may require re-operation to manage; no drainage suggests an obstructed tube, which can result in cardiac tamponade and/or pneumothorax which can be lethal. After awakening and stabilizing in the ICU for 18 to 24 hours, the person is transferred to the cardiac surgery ward. If the patient is in a CUB, equipment and nursing is "stepped down" appropriate to the patient's progress without having to move the patient. Vital sign monitoring, remote rhythm monitoring, early ambulation with assistance, breathing exercises, pain control, blood sugar monitoring with intravenous insulin administration by protocol, and anti-platelet agents are all standard of care. The patient without complications is discharged in four or five days. Alternate methods of minimally invasive coronary artery bypass surgery have been developed. Off-pump coronary artery bypass (OPCAB) is a technique of performing bypass surgery without the use of cardiopulmonary bypass (the heart-lung machine). Further refinements to OPCAB have resulted in minimally invasive direct coronary artery bypass surgery (MIDCAB), a technique of performing bypass surgery through a 5 to 10 cm incision. Heart bypass patient showing almost invisible residual scarring. Left: days after operation. Middle: chest scar, two years later. Right: leg scar from harvested vein, two years later. The choice of vessel(s) is highly dependent upon the particular surgeon and institution. Typically, the left internal thoracic artery (LITA) (previously referred to as left internal mammary artery or LIMA) is grafted to the left anterior descending artery and a combination of other arteries and veins is used for other coronary arteries. The right internal thoracic artery (RITA), the great saphenous vein from the leg and the radial artery from the forearm are frequently used; in the U.S., these vessels are usually harvested endoscopically, using a technique known as endoscopic vessel harvesting (EVH). The right gastroepiploic artery from the stomach is infrequently used given the difficult mobilization from the abdomen. Acute - patients without complications are typically seen 3–4 weeks post operatively, at which time driving may be resumed and formal cardiac rehabilitation begun to increase aerobic endurance and muscular strength. a cardiac stress test at five years is recommended, even in the absence of cardiac symptoms. an intensive medical regimen including statins, aspirin, and aerobic exercise is essential to delaying the progression of plaque formation in both the native and grafted vessels. CABG is one of the most common procedures performed during U.S. hospital stays; it accounted for 1.4% of all operating room procedures performed in 2011. Between 2001 and 2011, however, its volume decreased by 46%, from 395,000 operating procedures performed in 2001 to 213,700 procedures in 2011. Between 2000 and 2012, the number of CABG procedures carried out decreased across the majority of OECD countries. However, there remained substantial variation in the rate of procedures, with the U.S. carrying out four times as many CABG operations per 100,000 people as Spain. These differences do not appear to be closely related to the incidence of heart disease, but may be due to variation in financial resources, capacity, treatment protocols and reporting methods. 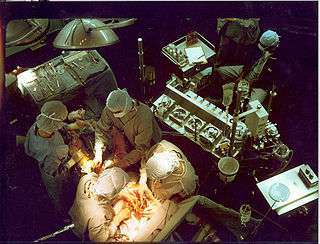 The first coronary artery bypass surgery was performed in the United States on May 2, 1960, at the Albert Einstein College of Medicine-Bronx Municipal Hospital Center by a team led by Robert H. Goetz and the thoracic surgeon, Michael Rohman with the assistance of Jordan Haller and Ronald Dee. In this technique the vessels are held together with circumferential ligatures over an inserted metal ring. The internal mammary artery was used as the donor vessel and was anastomosed to the right coronary artery. The actual anastomosis with the Rosenbach ring took fifteen seconds and did not require cardiopulmonary bypass. The disadvantage of using the internal mammary artery was that, at autopsy nine months later, the anastomosis was open, but an atheromatous plaque had occluded the origin of the internal mammary that was used for the bypass. Soviet cardiac surgeon, Vasilii Kolesov, performed the first successful internal mammary artery–coronary artery anastomosis in 1964. However, Goetz has been cited by others, including Kolesov, as the first successful human coronary artery bypass. Goetz's case has frequently been overlooked. Confusion has persisted for over 40 years and seems to be due to the absence of a full report and to misunderstanding about the type of anastomosis that was created. The anastomosis was intima-to-intima, with the vessels held together with circumferential ligatures over a specially designed metal ring. Kolesov did the first successful coronary bypass using a standard suture technique in 1964, and over the next five years he performed 33 sutured and mechanically stapled anastomoses in Leningrad (now St. Petersburg), USSR. René Favaloro, an Argentine surgeon, achieved a physiologic approach in the surgical management of coronary artery disease—the bypass grafting procedure—at the Cleveland Clinic in May 1967. His new technique used a saphenous vein autograft to replace a stenotic segment of the right coronary artery. Later, he successfully used the saphenous vein as a bypassing channel, which has become the typical bypass graft technique we know today; in the U.S., this vessel is typically harvested endoscopically, using a technique known as endoscopic vessel harvesting (EVH). Soon Dudley Johnson extended the bypass to include left coronary arterial systems. In 1968, doctors Charles Bailey, Teruo Hirose and George Green used the internal mammary artery instead of the saphenous vein for the grafting. According to the United States Centers for Disease Control, the average cost of hospitalization (only) associated with a coronary bypass operation in the United States in 2013 was $38,707, for an aggregate hospitalization cost of $6.4 billion. The International Federation of Healthcare Plans has estimated the average cost of hospitalization and physician fees for a coronary bypass operation in various countries as shown in the Table below. ↑ "Bypass Surgery, Coronary Artery". American Heart Association. Retrieved March 26, 2010. ↑ "Results for "aortocoronary bypass,coronary artery bypass graft" between 1960 and 2008". Google Ngram Viewer. Retrieved 8 January 2015. 1 2 Eagle, KA; Guyton RA; Davidoff R; et al. (October 5, 2004). "ACC/AHA 2004 guideline update for coronary artery bypass graft surgery: a report of the American College of Cardiology/American Heart Association Task Force on Practice Guidelines (Committee to Update the 1999 Guidelines for Coronary Artery Bypass Graft Surgery)". Circulation. 110 (14): e340–437. doi:10.1161/01.CIR.0000138790.14877.7D. PMID 15466654. ↑ Kolata, Gina. "New Heart Studies Question the Value Of Opening Arteries" The New York Times, March 21, 2004. Retrieved January 14, 2011. ↑ Ohki, S; Kaneko T; Satoh Y; et al. (2002). "[Coronary artery bypass grafting in octogenarian]". Kyobu Geka (in Japanese). 55 (10): 829–33; discussion 833–6. PMID 12233100. 1 2 SoS Investigators (September 28, 2002). "Coronary artery bypass surgery versus percutaneous coronary intervention with stent implantation in patients with multivessel coronary artery disease (the Stent or Surgery trial): a randomised controlled trial". Lancet. 360 (9338): 965–70. doi:10.1016/S0140-6736(02)11078-6. PMID 12383664. 1 2 Serruys, P.W. ; Morice M.-C.; Kappetein A.P. ; et al. (March 5, 2009). "Percutaneous Coronary Intervention versus Coronary-Artery Bypass Grafting for Severe Coronary Artery Disease". N Engl J Med. 360 (10): 961–72. doi:10.1056/NEJMoa0804626. PMID 19228612. ↑ Desai ND (January 2008). "Pitfalls assessing the role of drug-eluting stents in multivessel coronary disease". Ann Thorac Surg. 85 (1): 25–7. doi:10.1016/j.athoracsur.2007.08.063. PMID 18154771. ↑ Hannan, EL; Wu C; Walford G; et al. (January 24, 2008). "Drug-eluting stents vs. coronary-artery bypass grafting in multivessel coronary disease". N. Engl. J. Med. 358 (4): 331–41. doi:10.1056/NEJMoa071804. PMID 18216353. ↑ Li, X; Kong, M; Jiang, D; Dong, A (Dec 16, 2013). "Comparing coronary artery bypass grafting with drug-eluting stenting in patients with diabetes mellitus and multivessel coronary artery disease: a meta-analysis". Interactive cardiovascular and thoracic surgery. 18 (3): 347–54. doi:10.1093/icvts/ivt509. PMC 3930218 . PMID 24345688. ↑ Kitamura, S; Kawachi K; Kawata T; et al. (March 1996). "[Ten-year survival and cardiac event-free rates in Japanese patients with the left anterior descending artery revascularized with internal thoracic artery or saphenous vein graft: a comparative study]". Nippon Geka Gakkai Zasshi (in Japanese). 97 (3): 202–9. PMID 8649330. ↑ Arima, M; Kanoh T; Suzuki T; et al. (August 2005). "Serial angiographic follow-up beyond 10 years after coronary artery bypass grafting" (PDF). Circ J. 69 (8): 896–902. doi:10.1253/circj.69.896. PMID 16041156. ↑ Harmon, Katherine (August 6, 2009). "Heart-Lung Machine May Not Be the Culprit in Post-Op "Pump Head" Syndrome". ScientificAmerican.com. Retrieved February 2, 2010. ↑ Stutz, Bruce "Pumphead: Does the heart-lung machine have a dark side?" Scientific American, January 9, 2009. ↑ Li, Arthur E.; Fishman, Elliot K. (2003). "Evaluation of Complications After Sternotomy Using Single- and Multidetector CT with Three-Dimensional Volume Rendering". American Journal of Roentgeneology. American Roentgen Ray Society. 181 (4): 1065–1070. doi:10.2214/ajr.181.4.1811065. ↑ Force, T; Hibberd, P; Weeks, G; Kemper, AJ; Bloomfield, P; Tow, D; Josa, M; Khuri, S; Parisi, AF (1990). "Perioperative myocardial infarction after coronary artery bypass surgery. Clinical significance and approach to risk stratification". Circulation. 82 (3): 903–12. doi:10.1161/01.CIR.82.3.903. PMID 2394010. ↑ Bucerius, J; Gummert, Jan F; Walther, Thomas; Schmitt, Dierk V; Doll, Nicolas; Falk, Volkmar; Mohr, Friedrich W (2004). "On-pump versus off-pump coronary artery bypass grafting: impact on postoperative renal failure requiring renal replacement therapy". The Annals of Thoracic Surgery. Elsevier. 77 (4): 1250–6. doi:10.1016/S0003-4975(03)01346-8. PMID 15063246. 1 2 Silber, JH; Rosenbaum, PR; Schwartz, JS; Ross, RN; Williams, SV (1995). "Evaluation of the Complication Rate as a Measure of Quality of Care in Coronary Artery Bypass Graft Surgery". JAMA. 274 (4): 317–23. doi:10.1001/jama.1995.03530040045039. PMID 7609261. ↑ Selnes, OA; Gottesman, Rebecca F.; Grega, Maura A.; Baumgartner, William A.; Zeger, Scott L.; McKhann, Guy M. (2012). "Cognitive and neurologic outcomes after coronary-artery bypass surgery". NEJM. 366 (3): 250–7. doi:10.1056/NEJMra1100109. PMID 22256807. ↑ Leitch, JW; Thomson, D; Baird, DK; Harris, PJ (1990). "The importance of age as a predictor of atrial fibrillation and flutter after coronary artery bypass grafting". The Journal of Thoracic and Cardiovascular Surgery. 100 (3): 338–42. PMID 2391970. ↑ Murphy, GJ. ; Pike, K; Rogers, C. A.; Wordsworth, S.; Stokes, E. a.; Angelini, G. D.; Reeves, B. C. (March 12, 2015). "Liberal or restrictive transfusion after cardiac surgery". New England Journal of Medicine. 372 (11): 997–1008. doi:10.1056/NEJMoa1403612. PMID 25760354. ↑ Spertus, J. (March 12, 2015). ""TITRe"ing the Approach to Transfusions after Cardiac Surgery". New England Journal of Medicine. 372 (11): 1069–1070. doi:10.1056/NEJMe1415394. PMID 25760360. ↑ Sabik, Joseph (2010). "Off Pump Bypass Surgery: Improving outcomes for coronary artery bypass surgery". Clevelandclinic.com. Retrieved February 28, 2011. ↑ Sabik, Joseph (2010). "Minimally Invasive Bypass Surgery". Clevelandclinic.com. Retrieved February 28, 2011. ↑ Douglas, P. S.; Garcia, M. J.; Haines, D. E.; Lai, W. W.; Manning, W. J.; Patel, A. R.; Picard, M. H.; Polk, D. M.; Ragosta, M.; Ward, R. P.; Douglas, R. B.; Weiner, R. B.; Society for Cardiovascular Angiography Interventions; Society of Critical Care Medicine; American Society of Echocardiography; American Society of Nuclear Cardiology; Heart Failure Society of America; Society for Cardiovascular Magnetic Resonance; Society of Cardiovascular Computed Tomography; American Heart Association; Heart Rhythm Society (2011). "ACCF/ASE/AHA/ASNC/HFSA/HRS/SCAI/SCCM/SCCT/SCMR 2011 Appropriate Use Criteria for Echocardiography". Journal of the American College of Cardiology. 57 (9): 1126–1166. doi:10.1016/j.jacc.2010.11.002. PMID 21349406. ↑ Weiss AJ, Elixhauser A, Andrews RM (February 2014). "Characteristics of Operating Room Procedures in U.S. Hospitals, 2011.". HCUP Statistical Brief #170. Rockville, MD: Agency for Healthcare Research and Quality. ↑ Weiss AJ, Elixhauser A (March 2014). "Trends in Operating Room Procedures in U.S. Hospitals, 2001—2011.". HCUP Statistical Brief #171. Rockville, MD: Agency for Healthcare Research and Quality. ↑ "Indicator: International comparisons of surgical procedures". QualityWatch. Nuffield Trust & Health Foundation. Retrieved 5 May 2015. ↑ Lafortune, Gaetan. "Comparing activities and performance of the hospital sector in Europe: how many surgical procedures performed as inpatient and day cases?" (PDF). OECD. OECD. Retrieved 5 May 2015. ↑ Dee, R (2003). "Who Assisted Whom?". Tex Heart Inst J. Houston: Texas Heart Institute. 30 (1): 90. PMC 152850 . PMID 12638685. ↑ Haller, JD; Olearchyk, AS (2002). "Cardiology's 10 Greatest Discoveries". Tex Heart Inst J. Houston: Texas Heart Institute. 29 (4): 342–4. PMC 140304 . PMID 12484626. ↑ Kolessov, VI (October 1967). "Mammary artery-coronary artery anastomosis as method of treatment for angina pectoris". J Thorac Cardiovasc Surg. 54 (4): 535–44. PMID 6051440. 1 2 3 4 Mehta, NJ; Khan, IA (2002). "Cardiology's 10 Greatest Discoveries of the 20th Century". Tex Heart Inst J. 29 (3): 164–71. PMC 124754 . PMID 12224718. ↑ Kolesov, VI; Potashov, LV (1965). "Surgery of coronary arteries". Eksp Khir Anesteziol (in Russian). 10 (2): 3–8. PMID 5851057. ↑ Olearchyk, AS (1988). "Coronary revascularization: past, present and future". J Ukr Med Assoc North Am. 1 (117): 3–34. ↑ Olearchyk, AS; Olearchyk, RM (January 1999). "Reminiscences of Vasilii I. Kolesov". Ann Thorac Surg. 67 (1): 273–6. doi:10.1016/S0003-4975(98)01225-9. PMID 10086577. ↑ Glenn, WW (April 1972). "Some reflections on the coronary bypass operation". Circulation. 45 (4): 869–77. doi:10.1161/01.CIR.45.4.869. PMID 5016019. ↑ Ochsner JL, Mills NL (1978). Coronary artery surgery. Philadelphia: Lea & Febiger. ↑ Cushing, WJ; Magovern, GJ; Olearchyk, AS (November 1986). "Internal mammary artery graft: retrospective report with 17 years' survival". J Thorac Cardiovasc Surg. 92 (5): 963–4. PMID 3773554. ↑ Konstantinov, IE (June 2000). "Robert H. Goetz: the surgeon who performed the first successful clinical coronary artery bypass operation". Ann Thorac Surg. 69 (6): 1966–72. doi:10.1016/S0003-4975(00)01264-9. PMID 10892969. ↑ Kolesov, VI; Kolesov, EV (February 1991). "Twenty years' results with internal thoracic artery-coronary artery anastomosis". J Thorac Cardiovasc Surg. 101 (2): 360–1. PMID 1992247. ↑ Favaloro, RG; Effler, DB; Cheanvechai, C; Quint, RA; Sones Jr, FM (November 1971). "Acute coronary insufficiency (impending myocardial infarction and myocardial infarction): surgical treatment by the saphenous vein graft technique". Am J Cardiol. 28 (5): 598–607. doi:10.1016/0002-9149(71)90104-4. PMID 5116978. ↑ "About IFHP — IFHP". ↑ Gokhale, Ketaki (July 28, 2013). "Heart Surgery in India for ,583 Costs $106,385 in U.S". Bloomberg. A BBC film showing a patient undergoing a double bypass operation.